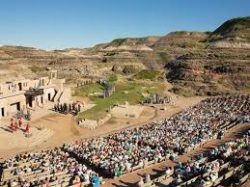 The Badlands Passion Play is holding auditions in Calgary on January 27th for actors and musicians for the upcoming play. Heading into it’s 26th year, The Badlands Passion Play (situated in scenic Drumheller) is a large scale outdoor, musical-based production depicting the life, death and resurrection of Jesus Christ, with a full band, over 120 actors and animals onstage, playing to up to 2000 people a night over 9 performances in July. The cast and band are made up of paid performers and a multitude of volunteer performers. They are currently looking for actors to fill a multitude of paid lead roles and paid band roles. May 17th for ensemble roles. Fridays to Sundays for ensemble roles. All ages and levels of experience are welcome to audition. PAID roles are available as well as volunteer roles.